Fantasy Productions (often abbreviated FanPro) is a pair of now defunct game and publishing companies from Germany and the USA, respectively, who held the BattleTech license for a time. Owned and managed by essentially the same people, they are often perceived as a single entity but legally they were two distinct firms. The original German firm existed from 1983 to 2012. The US-based firm (FanPro LLC) was created in 2001 and ceased operations in 2006. In Germany, the brand name is now used as imprint for the Fuchs & Fuchs GbR, with no remaining connection to BattleTech. The Fantasy Productions GmbH, originally based in Düsseldorf and later in Erkrath, Germany, was originally founded as a Gesellschaft bürgerlichen Rechts (GbR), a Partnership Agreement under the German Civil Code, in 1983 by Werner Fuchs, Ulrich Kiesow and Hans Joachim Alpers to produce gaming miniatures. Its roots are said to date back to the Fantastic Shop in Düsseldorf, established in 1977 as an importer of boardgames and books from Britain and the United States. FanPro GbR and the Fantastic Shop were merged into the Fantasy Productions GmbH (Limited Liability Company) in 1988. Besides producing miniatures, the FanPro founders had created the massively popular and successful German fantasy role-playing game Das Schwarze Auge (The Dark Eye), which was initially published in cooperation with the Schmidt Spiel & Freizeit GmbH (commonly known as Schmidt Spiele) and Droemer Knaur publishing house because the young FanPro enterprise was too small at the time to handle the project by themselves. The game is often regarded as the premier German RPG, on par with if not eclipsing (A)D&D. Kiesow's editorial work for Das Schwarze Auge was organized at FanPro, and the firm evolved into a major German publisher of role playing games and science-fiction/fantasy literature. They would publish The Dark Eye in-house following the bankruptcy of Schmidt Spiel & Freizeit GmbH in 1997. Under license from FASA Corporation, FanPro produced the German-language edition of BattleTech from 1988 onwards and also the German edition of Shadowrun, FASA's other highly successful game. FanPro did not merely translate the English material, however. German editions of given BattleTech products differ from the English originals more often than not, especially the earlier translations. FanPro would often add content like additional scenarios. They also created new products by combining material from several original sources into omnibus products (like Mächte der Inneren Sphäre, which is essentially a compilation of the five original House Books, or the Atlas der Inneren Sphäre which compiles astronomical and planetary data from a wide range of original sources, adding newly drawn maps). FanPro produced at least one completely original German-only sourcebook, "Ronin!". It was in turn used as the basis for the writeup on the Ronin Wars in Brush Wars, a subsequent publication. In a 2003 interview, FanPro CEO Werner Fuchs said they were a smallish firm with just about 20 employees and that they were barely profitable (he literally claimed that FanPro was a "non-profit enterprise" at the time). As of 2004, FanPro was reported to have 12 employees, plus a "large number" of freelance authors. When FASA unexpectedly withdrew from the market in 2001, the intellectual properties (IPs) to BattleTech and Shadowrun (among others) were transferred to WizKids. Christoph Nick, an avid BattleTech fan and freelance writer for FanPro at the time, convinced FanPro to obtain the license and take over and continue the English-language BattleTech IP for what was now Classic BattleTech, while WizKids created the new MechWarrior: Dark Age game in the same setting. FanPro created a sister company in the United States (FanPro LLC, see below) to license these IPs from WizKids, thus becoming the producer for the original (English) version of both Classic BattleTech and Shadowrun. The FanPro BattleTech license had the stipulation that they were not allowed to advance the timeline, keeping Classic BattleTech frozen at the conclusion of the Civil War era in 3067. This was done to avoid timeline conflicts with the MW:DA game that was now the main product line, and was set in the 32nd century. In 2007, FanPro's BattleTech and Shadowrun licenses ran out and were not renewed. FanPro also sold the rights to their other flagship product, Das Schwarze Auge, to Ulisses Spiele. WizKids licensed the BattleTech and Shadowrun rights to InMediaRes instead, who proceeded to market the games through their Catalyst Game Labs imprint (who were essentially the same people who had previously worked for US-based FanPro LLC; see below). In this way, FanPro reduced itself to its book publishing division, formerly their Phoenix imprint. FanPro thus ceased to be a producer of boardgame and RPG material, but continued its novel series for Das Schwarze Auge and also a series of German BattleTech novels, many of which were original work and not available in English (see List of BattleTech print novels#FanPro). This led to a disagreement with Catalyst over whether or not FanPro had retained the right to publish new German-language BattleTech and Shadowrun novels. FanPro ceased further publications for BattleTech and Shadowrun in 2008. In 2011, Ulisses Spiele acquired the orphaned German BattleTech license, took over existing stocks from FanPro as well as contracts, and seamlessly continued both the Classic BattleTech and MechWarrior: Dark Age novel lines from where FanPro had left off in 2008, keeping the numbering. Ulrich Kiesow died in 1997; Hans-Joachim Alpers died in 2011. With Werner Fuchs still at the helm, FanPro (now Fantasy Productions Verlags- und Medienvertriebsgesellschaft mbH) continued as a publishing house and RPG retailer until 2012. In that year the firm was closed down and the online FanPro Shop was merged into the online shop of the 17und8 GbR, a retailer company run by Werner Fuchs and Charif Ben Lasfar. FanPro initially redirected its web presence to that of the 17und8 GbR, though the web shop still kept the name "FanPro Shop" and the old FanPro logo for a time. It subsequently became the "F-Shop" and is now owned by Ulisses Spiele, while the 17und8 GbR underwent a restructuring and continues as purely an eBay seller enterprise after 1 February 2014. Together with his daughter Corinna, Werner Fuchs launched a new firm in 2012. Distinct from Fantasy Productions, the new Fuchs & Fuchs GbR (doing business as FanPro GbR) is a publishing house that continues some of FanPro's legacy, particularly the German translations of George R. R. Martin's massively popular A Song of Fire and Ice series. The old FanPro online presence including the FanPro online store was transferred to this new firm. 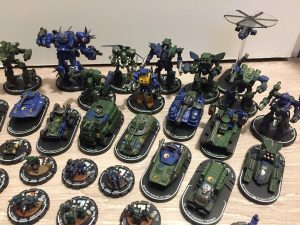 FanPro GbR has only tenous connections to the old FanPro business otherwise, and has nothing at all to do with BattleTech. In 2001, the owners of FanPro set up a sister company, Fantasy Productions LLC (also often referred to as FanPro US), in Chicago, although most of its employees worked remotely. 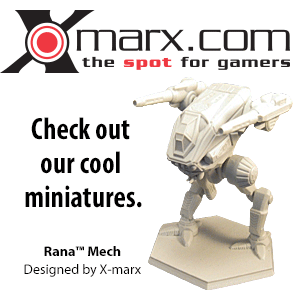 FanPro US initially licensed the rights to produce English-language Shadowrun books in early 2001 from WizKids, who had obtained the licensing rights from FASA, and by the summer of 2001 FanPro LLC had also signed an agreement to publish what was now known as the Classic BattleTech product line in English. The staff of authors that went to work for FanPro was largely identical to the people who had previously worked for FASA, so the transition was seamless. Because WizKids' own new BattleTech game, MechWarrior: Dark Age, was set some seven decades in the future from where the classic BattleTech had been left off, FanPro was not allowed to continue the timeline beyond the year 3067, giving WizKids the opportunity to shape the Jihad era between 3067 and the new game's Dark Age era however they wanted to serve as a background for their MechWarrior: Dark Age game. From 2001 to 2005, FanPro US released over a dozen original Shadowrun titles and reprinted core BattleTech titles that FASA had originally released, with a new cover and a FanPro product number, often in revised editions that included errata, and in the case of MechWarrior, Third Edition also with a renaming to Classic BattleTech RPG, to avoid confusion with the MechWarrior: Dark Age game line. They continued to release new Classic BattleTech books in English, and in 2006 released Total Warfare, the first in a series of revised full-color books for Classic BattleTech. FanPro Germany continued to translate these books and publish them in Germany, along with German-only Shadowrun books. Conversely, FanPro US published The Dark Eye, a translated English edition of Das Schwarze Auge. All English material published by FanPro (US) also bears the WizKids logo and is copyrighted to WizKids (instead of FanPro). FanPro LLC allegedly lost a significant amount of money when their distributor Fast Forward Entertainment (FFE), through whom all their income was funneled, collapsed. FFE is said to have grown too rapidly and hired employees with FanPro's money while creating what was described as an "accounting mess" through poor bookkeeping that made it impossible to find out just how much of FanPro's money they had actually spent. This, combined with business decisions by the FanPro owners that benefitted FanPro Germany to the detriment of FanPro US, spelled doom for FanPro US. The FanPro US staff made an attempt to buy the company out, but the owners refused. Subsequently, the staff all quit and then went to work for Catalyst Game Labs who had acquired the licenses. Catalyst even operates from the same business adress that FanPro LLC had previously had. This page was last edited on 11 March 2019, at 06:31.